My 10-12 year old ‘M2’s’ persuaded me to enter into the ‘Christmas Spirit’ this year, by requesting a Christmas play – some of them had done a play with their teacher last year and, apparently, had much enjoyed it! I duly complied and set about writing a play. The play tells the story of Father and Mary Christmas, amidst their Christmas preparations, losing their list of naughty/nice boys and girls, and sending the Elves off to compile a new one. The Elves finish their journey in M2’s classroom and use our star chart to decide if the M2 children should get any presents this year. Needless to say, the answer was yes! So, in the end, they return to Lapland with the list and Christmas is saved! In terms of language, I also managed to work in all of the structures we’d looked at over the course of this term – present simple, past simple and continuous, present perfect, comparatives, possessives and present continuous for future plans – as well as a song and a chant (the chant being based on the wake up shake up chant we do at the start of each class). 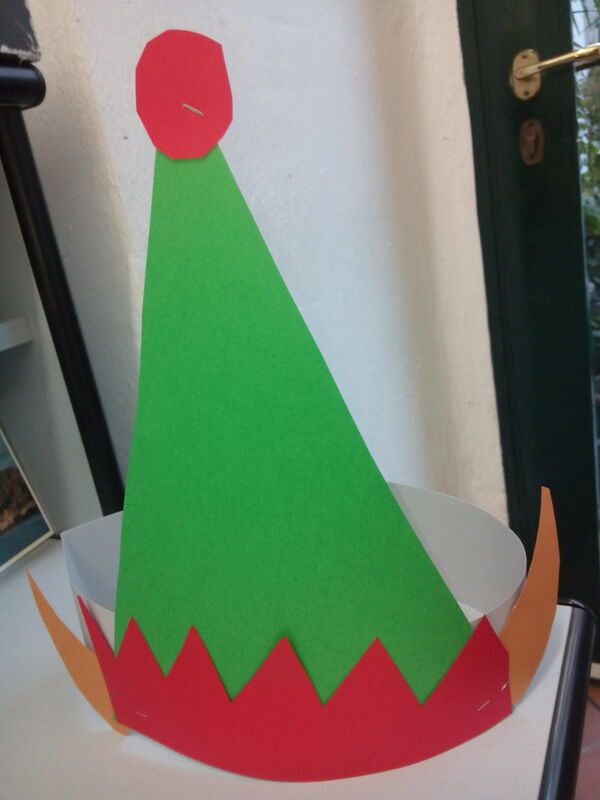 In terms of preparation, as well as rehearsal time (half an hour per lesson for three lessons), some time had to be spent making elf hats and shoes out of coloured card. Here is the hat I made as a model for them! The design inspired by a Google image, but I can’t claim credit for it – my lovely YLC (Young Learner Coordinator) figured it out! And here is a copy of the play. 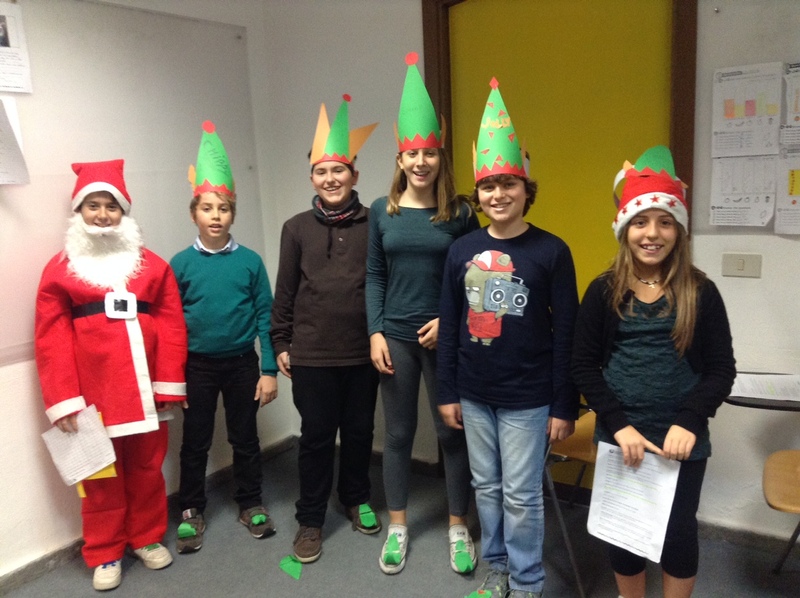 It is for a cast of 8 students and one teacher, but easily adaptable, as the number of elves is very flexible! I also had some Christmas-related fun with my L4b’s (Upper Intermediate teenagers): In a bid to try and balance the time:exam date:quantity of course book remaining ratio, rather than doing an un-related Christmas lesson, I converted a page of their course book into one. The course book page from Pearson Choices Upper Intermediate was a writing workshop, focusing on formal letters of complaint, within a unit on advertising. So a quick Google found me this letter of complaint to Santa. A speedy bit of editing enabled me to splice in some of the language that the Choices workshop centred around, that is to say language for formal letter writing, including the structure ‘Not only <inversion>….but …. too’ e.g. Not only were the presents not what I had ordered, but they arrived late too’. To lead in, I threw together a quick powerpoint with images of an advertisement for Santa’s Grotto, claiming to make all your dreams come true, a Christmas tree with presents beneath it and a screaming child, from which I was able, via some pair work, to elicit the story behind the letter of complaint. This was followed by some role-playing in pairs, student A was the 9 year child, with a rather impressive vocabulary, who wrote the letter and student B was the grumpy elf who answered the phone when said child called to complain (mentioned in the letter) and then the language focus, using a mixture of the Choices skill builder for identifying the target language and my own Christmas complaint letter-related examples for the ‘Not only…’ bit. Finally, I asked them to imagine it was Christmas day and they had just opened a…<show the picture on the course book page> …I think it was a fancy alarm clock and had them imagine the problems they might have with it, which they then compared with those mentioned in the model letter on the course book page, from which the homework of writing their own letter was set up. Less amazing still, but good value: turns out you can get a really good debate out of the topic ‘This house believes that Christmas should be abolished‘ with chatty Italian upper intermediate adult students! It also provided a nice opportunity for reviewing language for expressing opinions, agreeing and disagreeing, which we had looked at earlier in the course. So all in all, it’s been a fun run up to Christmas and, even better, now the holidays have actually arrived! This entry was posted in Classroom Talk and tagged activities, Christmas. Bookmark the permalink. ← Teaching teenagers “have to” and “can’t” for complaining – resurrected in TEA issue 71!